Tidemaster has it all. In the heart of the Ocean Drive section of North Myrtle Beach, this unit on the seventh floor (Unit # 703) has a wonderful floor plan. This unit has 835 square feet of space. This condo also has a keyless entry system. With Keyless entry, no need to worry about who has the key, or getting locked out. The living room overlooks the ocean and has a upgraded glass sliding door to your own oceanfront balcony. The balcony is also furnished with a table and chairs, and chaise lounger so you may enjoy your early morning coffee watching the sunrise. Wireless internet service is provided to you by Contract Data with all rentals. This service is provided at no cost to our clients. This unit is furnished with nice furniture. The living room has a nice arrangement with a sofa and 2 chairs, plus additional recessed lighting and a ceiling fan for added comfort. This condo offers a 50 inch flat screen TV with a DVD player in the living room. We also have a stereo with CD player. All new tile floors through out the unit, with carpet in the bedroom. The dining room seats six, four at the table and two at the breakfast bar. There is room enough for entertaining family and friends. The bedroom has a king-size bed (new mattress & box spring 2017), ceiling fan, 40 Inch Flat Screen TV , as well as two bunk beds in the hall alcove. The bathroom has been fully updated with new tile floors and granite counter tops and has a chair height toilet. The kitchen is fully-equipped with all new appliances, (LARGE CAPACITY) Washer and Dryer included. This newly renovated kitchen has new cabinets, granite counter tops, Franke sinks, and glass tiled back splash. This is a No SMOKING, NO PETS ALLOWED PROPERTY. My name is Tommy Sides and I have been offering oceanfront properties for family vacations since 1986. My trail & error experence over the years has provided me with valueable experence in the rental industry. I listen to my clients and I have very nice and upgraded properties that I am proud of. I am most proud of my repeat business, which let's me know that we are offering quality properties. This property is Location, Location, Location. We are in the Heart of the Ocean Drive section of N. Myrtle Beach and just a short walk to Main St and all of it's activities. You will also find this condo to be very spacious for a 1BR unit. The average 1BR is 450 to 650 square feet. My unit is 845 square feet with a 145 square foot oceanfront balcony. 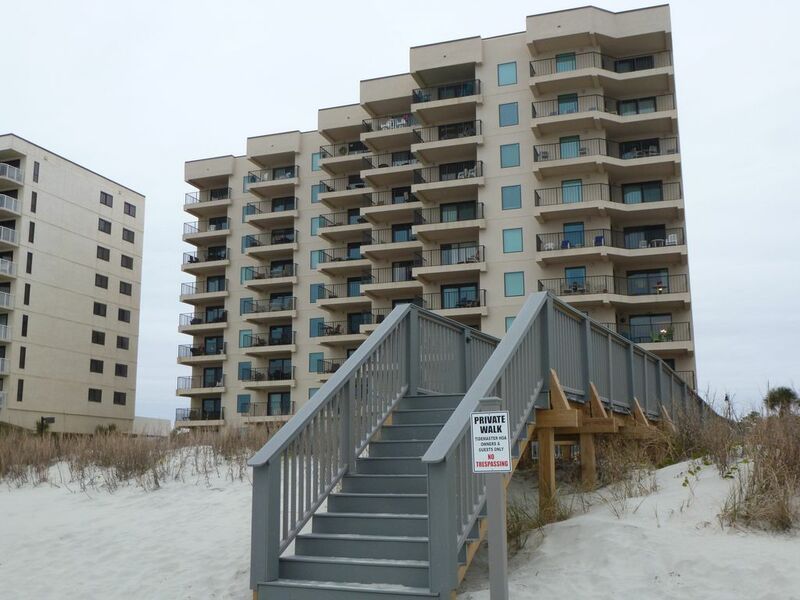 You will not find a larger 1BR unit anywhere in N. Myrtle Beach. Stay in this condo and enjoy the extra room. Central Heating and Air Conditioning Plus 2 Ceiling Fans for added Comfort. LINEN & TOWEL SERVICE IS OPTIONAL AT $30.00 PER BED FOR THE ENTIRE STAY. Large Capacity Washing Machine inside the condo. Large Capacity Dryer inside the condo. Parking in front of building with additional parking across the street in the overflow parking lot. FREE WIRELESS INTERNET PROVIDED BY CONNECT FREELY. Living Room overlooks the beach and Ocean. Great views with a Southern view thru the living room window. STAINLESS STEEL STOVE WITH FLAT SMOOTH GLASS TOP SURFACE. STAINLESS STEEL OVER THE STOVE MICROWAVE BUILT-IN. Fully Stocked Kitchen with Dishes, Silverware, Glassware and more. Fully stocked kitchen for cooking in. 2 Bar stools at Bar. 4 At the Table. This home has a 50 Inch Flat Screen TV in the living room and a 40 Inch Flat Screen in the Bedroom. Listen to Beach Music on the stereo. 94.9 is the local Beach Station or 105.9 for the oldies. DVD players at both TV's. Direct oceanfront Balcony with a Southern view down the Beach. The balcony has a table and four chairs for dining and a lounge chair. PLAY TENNIS AT MC LEAN CITY PARK JUST A FEW BLOCKS AWAY. Many golf courses are within a 10 min drive of the condo. Private oceanfront pool with large deck that looks out over the ocean and beach area. Comfortable lounge chairs. Kiddie Pool for the small children. future. Tommy is great to work with. Thank you for allowing us to stay in your condo! The kitchen was very nice and had everything we needed. My 2 girls (4 and 6 years) LOVED the bunk bed. They never even used the top bunk; we hung a sheet from the top and they had an awesome "tent" on the bottom all week :) The furniture was in great shape. This unit was very convenient, right beside the elevator (and never noisy); it was just a short walk to get to the pool, beach, and parking lot. One of my main concerns was that there was no parking garage but once we were there, it was not a big deal at all. Plus, we noticed a security guard when we came home late one night. One of the things we liked best was the location of the building. It was very close to grocery stores, golfing, restaurants, Barefoot Landing, and Robert Edge Parkway. I would also recommend for younger kids, McLean Park, which is a few blocks over. We'll definitely be back! We stayed in this condo for Spring SOS. The condo was extra clean, furnished and equipped very nicely. Tommy was easy to contact and great to work with. We will definitely be back. Thanks for a pleasant experience. Thank you Scott & Cathy for staying with us. I am glad that you liked the condo its furnishings and cleanliness. We have an awesome cleaning staff that takes great pride in how well the condos are maintained. We appreciate the opportunity to serve you and look forward to having you stay with us again. This condo is an excellent place to stay for the beach and is in easy walking distance to the bars and restaurants that are on Main Street. The condo was very clean, quiet, and well decorated. We enjoyed the larger TV's and full cable selection available and the internet worked great. Although we did not use the kitchen, it was well equipped. The owner, Tommy, was a pleasure to work with and communicated everything we needed to know to make our stay great. Gary, thank you for staying with us and the review that you posted. We appreciate our guest and look forward to making sure the condo is clean and updated to make your stay as pleasurable as possible. Please keep us in mind for your next trip to N. Myrtle Beach. WOW. I can not say enough wonderful things about this condo. It was absolutely beautiful! Very clean and well maintained with everything you need to enjoy your vacation. My husband and I Enjoyed sitting on the balcony drinking our coffee and tea in morning while watching the dolphins play in the ocean. Beautiful view! Tommy was a pleasure to work with and communicated in a very timely manner. I would definitely recommend this condo to couples or small families. I can't wait to return myself! Thanks Tommy for sharing your place. Sabrina, thank you for staying with us. I am happy that you enjoyed the condo and we were able to meet your needs and expectations. I enjoy trying to improve and upgrade all of my properties so that we can receive nice reviews such as yours. Please keep us in mind for your next beach stay.